Cousins Jeff and Simon Grier started the family-owned Villiera Wines outside Stellenbosch in 1983 and embarked on an extensive replanting of classic and local varietals. Cathy Brewer (née Grier) later joined the family team to head up the sales, marketing and export divisions. 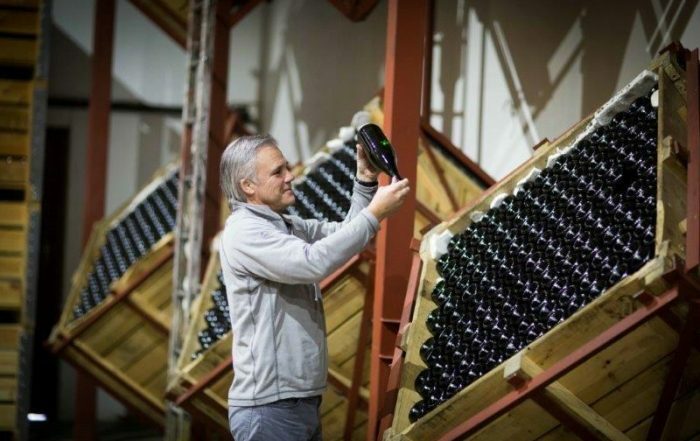 The introduction of hi-tech cellar facilities for the production of still wines as well as Méthode Cap Classique combined with a unique wine business philosophy has seen Villiera developing into one of the largest private wineries in the country. Award-winning winemaker Jeff Grier crafts a range of wines characterized by a strong reflection of Villiera’s unique terroir and the retention of the distinct aromas and flavours of the different varietals. The Griers have been pioneers in the Cap Classique category and their innovative approach has been evident other categories as well as in their business. Approximately 35% of the wine production at Villiera is currently focused on bottle-fermented sparkling wines. A joint venture with Frenchman and champagne specialist Jean Louis Denois in the mid 1980’s has culminated in some of the finest Méthode Cap Classique sparkling wines in the country.